As an active member of NSTRA & AKC for many years, I have observed dog owners caring for their dogs at field trials. Most of the folks are very diligent to make sure their dogs are comfortable and have food, water etc. A major concern for dog owners is making sure their dogs do not spill their water. While sitting around the campfire at one of our dog training camps, a friend said, “Why doesn’t someone come up with a water bowl that attaches to the top of a tie out stake”? Having 30 plus years in the machine design and building industry, I thought, I should be able to design and fabricate that! It was a couple of seasons after that night that I finally put pen to paper and came up with the first of a few proto type dog stakes with an attachable bowl. After field testing different designs and materials and getting input from pro trainers, I developed what I call the “K9 SOS” (Stake Out System). 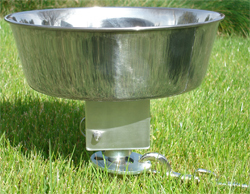 One of the most important features of the K9 SOS is the attachable stainless steel bowl. The bowl can be attached or removed in 10 seconds. The attached bowl is spill proof and very visible, which makes it less of a tripping hazard compared to a standard stake out. I chose Stainless Steel as the primary material for the K9 SOS; Stainless Steel is very durable and rust resistant. The 304 stainless steel stake is easy to install or remove from the ground. It has a rotating disk that prevents the chain from wrapping up around the stake. I believe this is the most durable, strongest and best dog tie out on the market. For those of you that use a chain gang set up, I have also created the “BS” (Bowl Stake). The BS is a stainless steel bowl with a stainless steel stake permanently attached. It can be pushed into the ground, making it spill resistant.